It's seven oclock in the morning, and the buzzing of my alarm clock insists that I gather my wits about me and begin to rise to what promises to be a day of occasions. Reaching across the end table I manage to find the remote and click on the television. Across the screen flashes images of the local weatherman and a plethora of bundled children sliding down local hillsides on whatever form of sled they can pull together. My mind steps to the side. Now where am I again? In bed at home in Kansas City where the weather has been cold and blustery? Hmmm. No, thats not it. Perhaps Im visiting my parents in Northern Michigan, right in the heart of the snow-belt that produces in excess of a hundred inches of snow each year. Not quite. snowflakes! Im sure that there is more than one citizen in Vegas who goes by the name Snowflake. In fact, I believe I saw her name, photo and phone number on several cards adorning the streets around town. Unfortunately the flakes Im talking about were white and frozen, and they made this writer glad that he packed his heavy Carhardt jacket for the trip. Then again, the Diamond of the Desert is known for messing with probability, so why should the weather be the exception? Climatic issues inclusive, the CES was filled with surprises. Digital amplification seemed to abound at this years CES. Tact, Bel Canto, Chord, and Audio Research were among the DSP-based bunch. Jeff Rowland was demonstrating his little 201 and 501 digital powerhouses to good effect. Its always amazing to see such tiny boxes driving even difficult speakers with ease. But perhaps my biggest surprise came from a room with the name Zetex Semiconductors on the door. Whats this guy doing at the audiophile section of the show? I pondered. Walking inside the room I was faced with what appeared to be an almost-empty audio rack flanked by a pair of ProAc speakers. Upon closer inspection I found what looked to be a small circuit board with a few chips and some small binding posts with speaker wire attached. No offense to the designers, but this thing looked like nothing more than a board pulled from a computer tower. Its total weight would be measured in ounces, not pounds. The guys at Zetex have designed a new type of digital topology that they are calling Class Z, of course. Whatever they want to call it, this little piece of silicon produced some very refined sound. I liked the sound better than that of many of the big guys mentioned above, even without the fancy chassis. I cant wait to find out who incorporates this technology. Serious high-ender Halcro of New Zealand has jumped into the digital realm with its new line of components aimed at the serious home-theater and multichannel market. Halcro's series of MCA amplifiers can be had in two, three, five, or seven-channel designations with each channel designed as a card-based system for easy replacement if it goes bad. In fact, this new line of components is designed to be permanently connected to the Internet via your PC and will send the dealer an e-mail if a breakdown occurs or may be imminent. Does it prepare the weeks menu and do the grocery shopping as well? NuForce is another company to keep an eye on. They were showing their "Analog" switching amplifier, which they claim eliminates the sawtooth waveform for modulation often required of class-D amplifiers. They may be onto something if the sound coming from a pair of well-worn Sound Dynamics speakers is any indication. No longer content with using another manufacturers goods to demo their electronics, companies like Pass Labs, Cary Audio, Gamut, and Bluenote are now building their own speakers. I especially liked the sound coming from the Gamut L3 monitor. Using the now-popular curved cabinet and Scan-Speak drivers, these speakers sounded refined and musical. Italian manufacturer Bluenote was showing the Reale. I failed to hear this speaker, but a trusted ear tells me that the sound coming from this three-way floorstander using a ceramic tweeter and a paper/cashmere woofer was intoxicating. The comeback-of-the-year award has to go to IAG, which is bringing back Audiolab electronics. Shown were the 8000-series amp, preamp, and integrated, as well as a separate line of home-theater products. Word has it that Quad is manufacturing the original Audiolab audio designs, while TAG McLaren is doing the home-theater products. 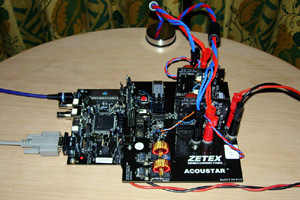 The original 8000 integrated was known to be one of the great values in high-end audio. I cant wait. The other welcome surprise was the return of ESS Laboratory. Famous for the Heil Air Motion Transformer driver, ESS is back with a version of the original AMT and a few new designs using this high-frequency driver. I still romanticize the sound coming from a college friends AMTs back in 1981. The legendary transmission-line speakers originally designed by Bud Fried seem to finally be back in full swing since the company was reorganized by a group of Pennsylvania audiophiles, including Mr. Fried himself. These robust-sounding speakers are always musical and have a fond spot in many a music lovers heart. I somehow thought it would never happen. Silly me actually believed that MP3 players and other such portable devices would never become a real part of the audiophile community. They are too small and not nearly tweaky enough for those of us attracted to hundred-pound chassis with separate power supplies and fire-hose speaker cables. Yet when I walked into the Avantgarde room and turned to my left, I stood facing a shiny, black pair of powered Solo speakers connected to a tiny, white Apple iPod sitting on the smallest of pedestals. It almost seemed like the little guy might by overpowered by the esoteric speakers and hurled from the room at any moment. But there it sat, its innards silently processing and producing sound that was flawed yet too good to dismiss. Damn. Focal-JMlab jumped on the iPod bandwagon as well by showing the new iCub system. 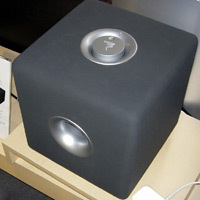 The iCub uses a version of Focals new Cub2 subwoofer with a variety of connectivity options as the heart of a system. You simply connect your iPod, PC, or server via a digital cable. A pair of speakers may then be connected directly to the outputs of the iCub's stereo amplifier and youre off to the races. Servers could also be found in more and more rooms this year as the main source for demos. VRS, a company that has been showing servers at the CES for a few years, came out with the new Gold multimedia server. It can distribute movies and music to any room of the house as well as let the audiophile play with sample rates to his heart's content. Arcam introduced a $4500 server, and if the quality of Arcam CD/DVD players is any indication, this piece will be a winner as well. 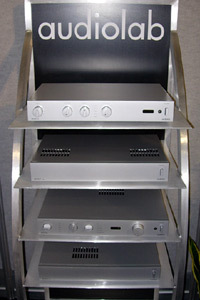 Even entry-level audio company Cambridge Audio displayed the Audiofile Azur 640H music server. At only $1399, this 160GB server is equipped with the same Wolfson DACs used in Cambridge's top CD player and will hold 300 uncompressed albums. If that doesnt quite do it, you can daisy chain up to four of them together (in different rooms if you like) for over 1200 albums of storage. With all of this talk of servers and digital amps, I think Im developing a case of hives. So for the sake of medicinal purposes, lets get back to the basics. I had an absolute drool fest when I entered the VMAX Services room with Unison Research electronics and Opera speakers front and center. In my minds eye, the lights dimmed and a golden aura appeared at the front of the room above the most beautiful integrated amplifier I have ever seen. Dubbed the Performance ($9500), this Unison Research amplifier is a giant at 24" wide and 110 pounds. The Performance is dual-mono design with three KT88 tubes per channel run parallel single-ended to produce an intoxicating 45 watts of pure class-A power. Just looking at it I felt the same awe one gets when admiring the woodwork of a vintage Chris-Craft speedboat or the fine walnut burl of a Bentley dashboard. Be still my credit card. The Performance was connected to an equally beautiful pair of Opera Divinia speakers ($8995) in a stunning African mahogany finish. With a little encouragement and a case of fine Chianti, I could have spent all four days of the show camped out in front of this rig listening to every Italian opera ever written. Bella, bella, bella. At the financial polar extreme has to be one of the biggest bargains in hi-fi history. 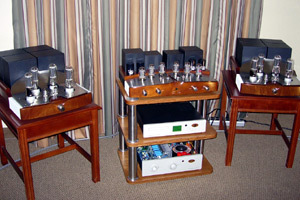 Kevin Deal of Upscale Audio was at the CES as distributor for PrimaLuna tube amplifiers. These amps are getting some good press right now and deserve every bit of it. I simply cannot understand how anyone can build an integrated amplifier to such a high standard for $1095. This gets you the PrimaLuna ProLogue One, a 35Wpc EL34-based integrated that has point-to-point wiring, ceramic tube sockets, auto-biasing, and good looks. For an extra $250 you can move up to the KT88-based ProLogue Two. There are quite a few inexpensive tube amps being turned out of China right now, and Ive seen and heard my share of them. That said, Ive never seen this kind of quality before. On the analog front, I was especially taken by a pair ultra-expensive 'tables, the likes of which I will never be able to afford (an evil laugh comes from the next room). The Deco, from Nottingham Analogue, is Tom Fletchers masterpiece. At $33,000, it is a refinement of every engineering practice that Nottingham believes in. Fletcher told me that they were willing to break any of the rules they were currently following to build the best turntable they could design. What they found out was that many of the original design ideas and materials used were right on target. Obvious changes were an absolutely massive platter in a most unusual diamond shape -- stepped toward the bottom and topped with a slab of pure graphite. The overall impression is very art deco, of course. Now for something completely different. From Continuum Audio Labs of Australia comes the Caliburn weighing in at $50,000. 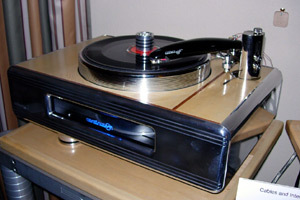 There is really no describing this turntable. Its part 1950s retro console and part Starship Enterprise. Its art nouveau meets The Fifth Element. The platter weighs in at over 80 pounds, with half of it above the plinth and half of it bathed in blue light and showing through a window in the front of the plinth. The tonearm is called the Cobra and looks like large alien fishing tackle carved out of a strange new-age composite. The website goes on and on about the most technically advanced this and that. What I can tell you is that the Caliburn looked like $50,000 and almost seemed like it was making music without turning it on. Best tweak: Gold-plated fuses and circuit boxes from IsoClean Power. You know you want 'em. More chrome than a 56 caddie bumper: No contest here. The award goes to folks from Chord for their Choral series, Brilliant Edition electronics. One fingerprint and you run screaming. Cotton gloves required for use. Oh, and they sounded fantastic on the NEAT speakers they were driving. Best demo material: The folks from Sunny Cable had a DVD copy of the newest martial-arts extravaganza, House of Flying Daggers. I went to this demo three times. It was multichannel, but you had to stand behind all of the speakers. It just didnt matter. It was sonically and visually stunning. Cant wait to see it in the theaters here. Most outrageous cable design: Sunny Cable wins again. They had a power cord called the Anaconda that was larger than the actual snake. I mean this thing was larger than a regulation fire hose. 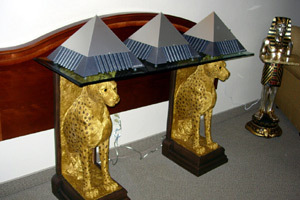 Sunny, the designer, said it takes weeks to make by hand and he has no idea how to make it commercially viable. Best treats for audiophiles: Forget the Swiss chocolates and the Oreo cookies. Pen Audio was handing out bottles of Finlandia vodka attached to their product literature. Way to go! You obviously know your market. Total Funk award: Goes to Mel Audio, which not only had the most artsy-looking equipment, but also had just about every type of component in their product lineup -- from cables to speaker stands and everything in between. I would like to end with a comment about three particular gentlemen whom I hold in very high regard. These gentlemen have companies that manufacture some of the finest components in the business, yet that is not what makes them so special. What makes these men so special is how deep their love of music (over equipment) is. When you walk into one of their rooms, you are much more apt to learn about a newly recorded concerto or a great, old jazz performance than you are to be bombarded with sales pitches. Keith Herron of Herron Audio always has one of the best-sounding rooms. He also has introduced me to some really great choral music and rekindled my interest in Louis Armstrong. Tom Fletcher of Nottingham Analogue couldnt wait to play me one of Vladimir Horowitzs final recordings on vinyl. He was grinning ear to ear as he spoke of the octogenarians performance. I had a great discussion with Roy Johnson of Green Mountain Audio about a Chick Corea recording he was playing. I shared a story of an encounter I had with that particular musician while in college and on we went. I always love hearing his newest speaker, but I also look forward to talking music with the man behind it. Each of these men always produces quality sound in his room, perhaps because each knows music and puts it before the equipment. Perhaps theyre all onto something.